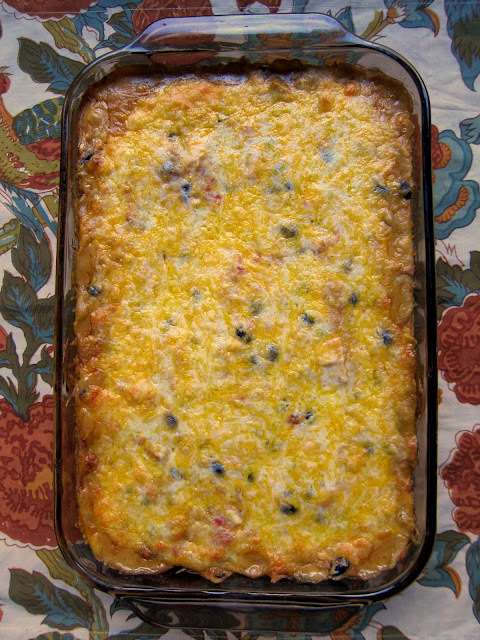 Chicken Taco Casserole - SO GOOD! Corn tortillas, cream of chicken soup, sour cream, Rotel, black beans, taco seasoning, chicken and cheese. Takes a minute to assemble and it on the table in 30 minutes. Everyone cleaned their plate and went for seconds. Great casserole for a potluck. Can also freeze for later. Quick, easy, kid friendly and delicious! This is one of those dishes that doesn't look good, but it tastes GREAT! This is super easy to make. I used rotisserie chicken and I had the casserole assembled before the oven was done preheating. The hardest part of this recipe is tearing up the corn tortillas. You can control the spice level by selecting either mild, original or hot Ro-Tel tomatoes. I went with original and it was perfect. Feel free to top the casserole with some more salsa, sour cream, guacamole or olives! This would be a great casserole for all your little ghost and goblins before or after trick-or-treating tonight. Preheat oven to 350ºF. Lightly grease a 9x13-inch pan. In a large bowl, combine the chicken soup, sour cream, Ro-Tel, black beans, taco seasoning and chicken. Set aside. Tear 6 corn tortillas and put them in the bottom of the pan. Spread half of the chicken mixture over the tortillas. Top with 1 cup of cheese. Repeat layers. Bake 30 minutes, until bubbly and cheese is starting to brown. Oh you are wrong, it looks good to me. Am having to try and stay off corn right now to see if that is why my blood sugar is out of wack. Wonder how big a difference this would be using WW tortillas. I know it won't be a good. sounds yummy and can't wait to try it! To make it easier to get the corn tortillas into pieces, I use a pizza cutter to cut them into smaller pieces. Quick, easy, and fun too! That would be such a big hit in our house! I was coming here to recommend the pizza cutter and Cheryl beat me to it. :-) So much easier - I just stack the tortillas and cut in a grid pattern so it ends up in small squares. This was for a casserole I used to make that called for flour tortillas. I will have to try your recipe since in the past couple of years I have grown to love the earthy flavor of the corn tortillas a lot more than the flour ones. It has been forever since I had taco casserole and never did it with chicken. This sounds like it would be great. We had this last night and it was a winner! I made this tonight for dinner. Very easy, with ingredients that aren't hard to find We both loved it. I had fresh cilantro in the fridge so coarsely chopped some and put it on after dishing the portions. If I weren't so lazy tonight I would have added chopped fresh tomatoes and lettuce on top as well. This was good. I bet a can of corn - drained - would be a good addition too!